It is that time of the year when activities carried out towards environment protection climax, and rejuvenate with even greater enthusiasm. As the calendar changes to the month of June, concerned people from around the world await the 5th date of the month to be celebrated as the World Environment Day (WED). WED is an annual event that is aimed at being the biggest and most widely celebrated global day for positive environmental action, involving everyone from everywhere. WED celebrations first began in 1972 and has since then grown to become one of the main vehicles through which the United Nations (UN) stimulates worldwide awareness of the environment and encourages political attention and action. The WED 2011 is even more special for those living in India and in the Indian sub-continent since India, one of the fastest growing economies in the world that is embracing the process of a transition to a Green Economy, will for the first time ever play the global host to this day. The Secretary for Environment & Forests of the Govt. of India Dr. T. Chatterjee pointed out India’s offer to host WED as another expression of India’s strong commitment to work with the global community for sustainable development. WED is also being seen as the inauguration of a series of events leading up to the hosting of the 11th CoP to the CBD. It will flag off the celebrations of the international decade for biodiversity. “This will in addition signal India’s commitment to the biomass economy so dependent on the sustainability of our natural resources,” the Secretary concluded. 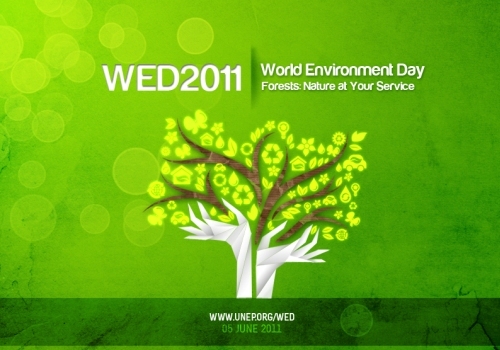 The theme for the WED 2011 is chosen to be “Forests: Nature at Your Service”, in line with the UN’s declaration of the year 2011 as the International Year of Forests. Forests cover one third of the Earth’s land mass, performing vital functions and services around the world which make our planet alive with possibilities. Over 1.6 billion people depend on forests for their livelihoods. Forests also play a key role in our battle against climate change, releasing oxygen into the atmosphere while storing carbon dioxide. Even as you read this, Government agencies and Civil Society in India and around the world are gearing up for bringing people together on WED for ensuring a cleaner, greener and brighter outlook for themselves and for the generations to come. Two of our most prominent cities – Delhi and Mumbai – are the venue for this year’s global celebration of the environment. A myriad of activities are being organised by these cities to inspire Indians and people around the world to take action for the environment. Media houses are joining in and popular faces are doing their bit for facilitating mass mobilization. Everyone counts in this initiative and WED relies on all of you to make this happen! If you feel for our forests, if you care for ‘our common environment’ and if you believe that the future generations have as much a right to live as we do, speak it out and make sure your voice is heard. This WED 2011, you MUST be the change! Delhi Marked World Environment Day 2010 in Style! PrevBayer Young Environmental Envoy Program Invites Green Dream Applications! This is so wonderful!! I love this new game on facebook, I believe it’s an Indian game and it is based around wisdom and intellect vers.. fighting and material.